Warner Bros. bought the rights to a Wired article about McAfee's flight from Belize. If you were worried that internet mogul John McAfee's story just wasn't going to get the prominence it deserves, fret yet not, for Warner Bros. has bought the movie rights. McAfee's tumultuous escape from Belize - where he has yet to be accused of any crime - after the murder of American expatriate Gregory Faull, will be written, directed and produced by John Requa and Glenn Ficarra, aka the guys behind Crazy, Stupid, Love and Bad Santa. 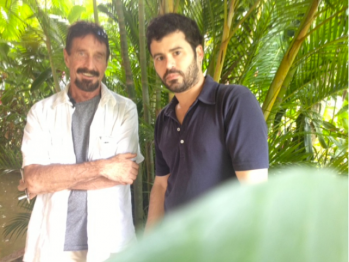 The movie, as yet untitled, will be based on a Wired article, John McAfee's Last Stand. The article begins as an investigation into McAfee's alleged drug misdeeds, and starts a few weeks before the murder. Meanwhile McAfee himself is allegedly living quietly in Oregon, far, far away from his former home. He's collaborating on a graphic novel about his experiences. When he's not accusing the authorities in Belize of arranging murders and supporting Hezbollah, that is. "I blend well with the ranchers and cowboys that I lived amongst for so many years," says McAfee. "They are a sympathetic lot."